One of the more interesting things to me that came out of the Google Searchology event this week was “Google Squared.” It’s a new search tool launching later this month that tries to build spreadsheet-like answers to anything you search for. I had a few screenshots from the event that take a deeper look that I wanted to share, plus how it compares to the forthcoming Wolfram Alpha fact engine. Google Squared (it’ll launch here in the future) allows you to search, then it compiles results in tabular form — rows and columns. For any search, Google examines the pages that it finds and tries to figure out what’s the best way to tabularize the information — IE, to put it in a structured, orderly form. 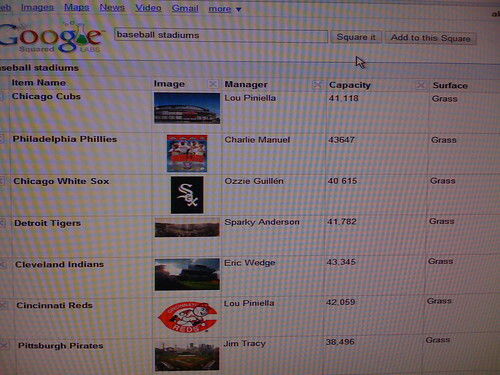 You can see how major stadiums are all listed, along with an image of them, the current manager of the baseball team, the capacity of the stadium, the type of playing surface and so on. Clicking on the “Add Items” link lets you bring in other information. I can’t recall, but I think when you do this, Google will also populate all the columns in the table for that item with its best guess at values relating to it. The service, when live, will be part of Google Labs. That means it’s an experiment, not really intended for prime time searching. 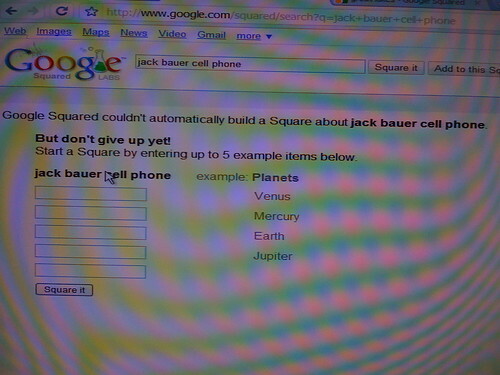 And as Google itself readily admits, there’s plenty of ways it trips up. You can see “Item Name” shows the name of episodes that are listed. When creating tables, Google Squared’s algorithm tries to guess at what are common attributes about items that it thinks are worth listing. 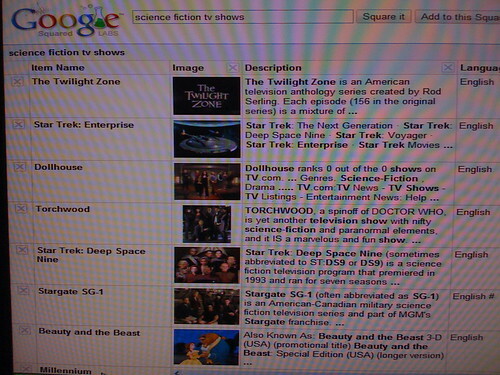 In this case, it clearly figured out that for “battlestar galactica,” the common items to list would be episodes. But the algorithm flubbed on knowing that it should have gone with “Episode Name” rather than “Item Name” for that particular column. You can also see that for the “Written By” and “Directed By” columns, it is missing several values. As said earlier, in these cases, someone could edit the empty boxes to add information, then save that as a personal “Square” for future use. 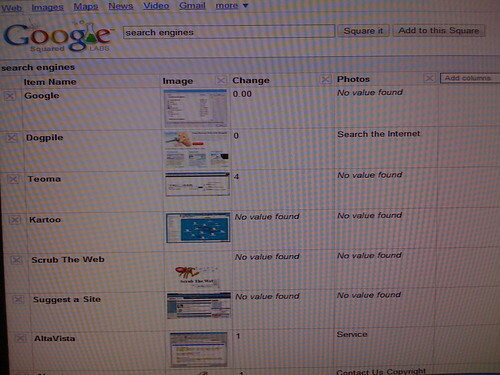 More issues — I don’t think you can sort the columns, nor does Google Squared put any particular sorting scheme to them, that I can see. In the example above, the items aren’t listed by episode name or date — you just get a bunch of items. From long experience in working with tables, I can tell you that a clear order is essential for anyone hoping to understand the information at a glance. I said it was experimental, though, right? 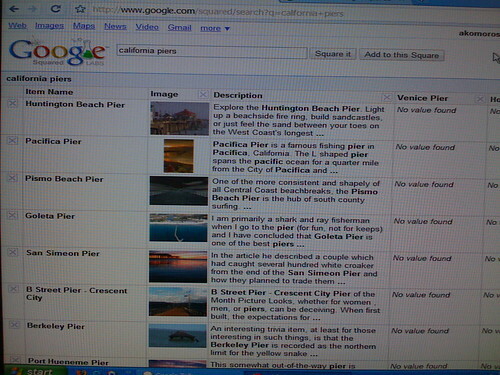 Overall, don’t expect perfection from Google Squared. Far from it. 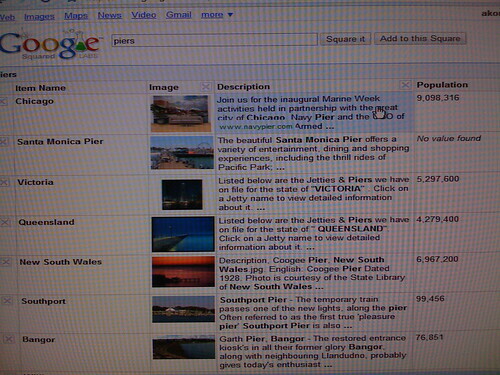 But as Google’s Matt Cutts pointed out, it can be kind of addictive to play with. Naturally, there continue to be comparisons with Google Squared to Wolfram Alpha, which is expected to launch as early as tomorrow. Is this more of Google trying to steal Wolfram’s thunder, as some felt when Google rolled out it release of chartable public data on US population and unemployment rates late last month? 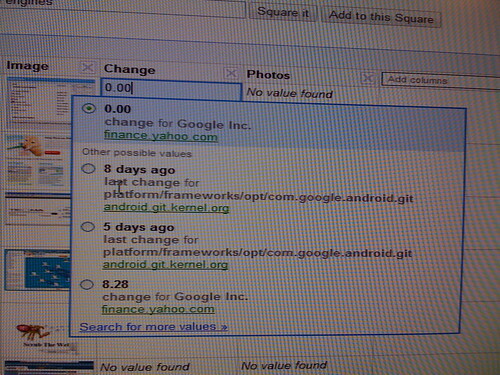 Google Squared wasn’t whipped up overnight. Many months ago, I saw an early version of the product. 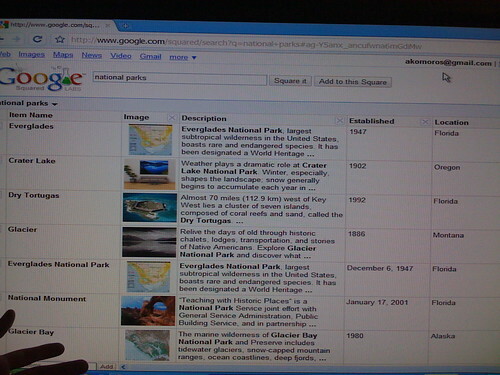 Similarly, Google structured data search didn’t just happen in the matter of days. These were projects well in the works before Wolfram Alpha gained recent attention. 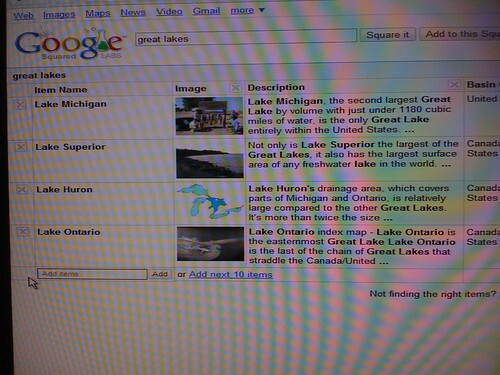 Google Squared, in a way, goes one better than what Wolfram Alpha is doing. 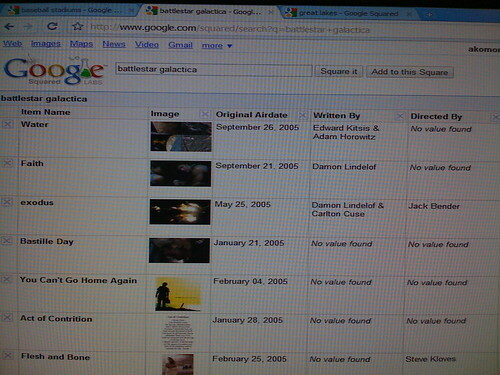 Wolfram’s data comes from taking in structured data. As a result, there are lots of questions it doesn’t know about. And while the human curation of this data helps in accuracy, doing a search and coming up with nothing is a disquieting feeling. Moreover, since my initial Impressive: The Wolfram Alpha “Fact Engine” post, I’ve had a chance to use a live private version of the service directly. I already knew (as my original review mentions) that it had many gaps in its knowledge base. But running more queries also shows that even if Wolfram Alpha has information, you might not find it, if you haven’t asked in the right way. I’m doing a future post to explain this more. So neither service is perfect, and they will compete to each other to some degree — and that’s fine. 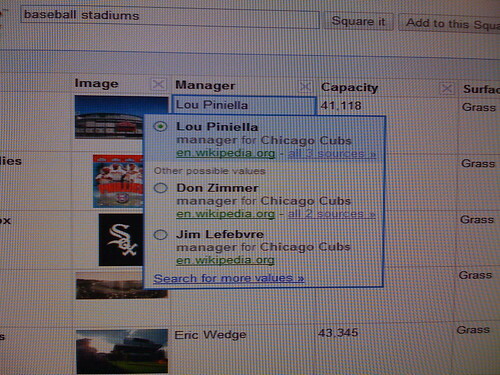 With luck, the competition will help us see better ways of finding both structured data (stuff you get in columns and rows) plus ways to organize the unstructured world that way. 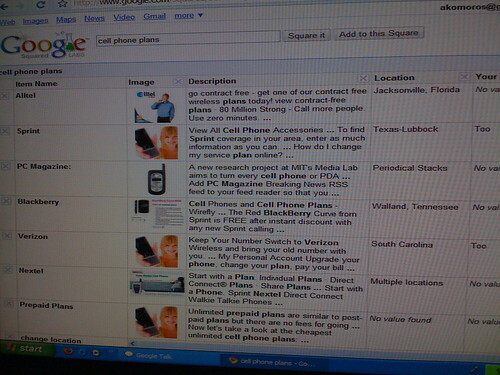 Finally, TechCrunch has a video of Google Squared in action.